Police Officer Robert Melton succumbed to complications of gunshot wounds sustained on June 3rd, 1981, after being flagged down by citizens and told of a robbery in progress. He and his partner were flagged down near the intersection of Compton Boulevard (modern day Gardena Boulevard) and Vermont Avenue and were told that an elderly male had been pushed into nearby bushes. As they drove to the location of the bushes a male subject appeared and opened fire with a rifle, critically wounding Officer Melton. Officer Melton's partner was able to return fire and killed the subject. Responding officers located the dead body of the robbery victim in bushes approximately 50 yards from where Officer Melton was shot. Officer Melton never fully recovered and remained confined to wheelchair. Due to his weakened condition he was unable to undergo required heart surgery and he subsequently passed away on November 1st, 2003. Officer Melton is survived by his two daughters. 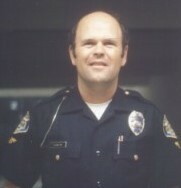 I am currently in the Los Angeles Sheriffs Academy, and reflecting on Police Officer Robert D. Melton’s memorial page. I grew up in Redondo Beach and Gardena is the next city over. Growing up you never hear about incidents such as this but after taking some time to reflect on the career path I’ve chosen it really hits hard. And it being so close to home on a street I frequently drive down it makes you realize anything can happen anywhere. Also to battle with the injury for so long. Now, every time I drive down Vermont I will remember Police Officer Robert D. Melton and the ultimate sacrifice he made fearlessly in the line of duty.